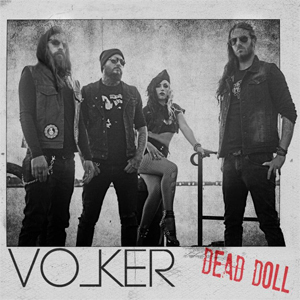 VOLKER are new to the North American heavy metal scene, but are destined to break out in a big way with the release of their upcoming melodic assault, Dead Doll, hitting North American retailers on May 26, 2017 via Overpowered Records /AISA/RED distribution. North American pre-orders for Dead Doll are available now via Amazon in digital and CD formats. Building upon the diverse musical background of the French four-piece, Dead Doll blends assorted heavy music influences such as 90's grunge rock, retro power metal, classic rock and even horror punk to create an accessible, engaging sound that has yet to be matched by any current artist of late. Check out a video for VOLKER's single "Obey!" on KNAC.COM HERE. The North American version of Dead Doll also features a bonus remix of the track, remixed by Strugg. Whether soaring at the top of her impressive range above striking guitar harmonies, or deftly growling amidst pummeling double bass and searing solos, frontwoman Jen Nyx more than proves her diverse skills on Dead Doll. Conjuring visions of the macabre, Nyx leads with a seductive aggression, flanked by seasoned French musicians John Aupeix on drums, Emmanuel Pliszke on bass and lead composer Ulrich Wegrich on guitars. VOLKER came together in 2014, comprised of a group of friends forged by the French metal scene. Nyx - whose lyrical works have always been inspired by themes of horror, sorcery, dark romance and death - formerly fronted the local metalcore group NOEIN. When musicians Aupeix, Pliszke and Wegrich formed VOLKER as a side project (all three are currently members of extreme black/death group OTARGOS, and Wegrich is also the former vocalist of REGARDE LES HOMMES TOMBER), they brought in Nyx with the intention highlighting her clean vocal abilities. As a band, their ultimate goal was to break out of the extreme metal scene and delve into a heavy, dark rock sound. Thus, VOLKER was born. Composer/guitarist Ulrich Wegrich states: "Conceptually, Dead Doll is inspired by old horror movies and gothic themes such as ghosts, death, sorcery, etc. All of the lyrics were written by Jen and are inspired by the darkness in our world, and some - mainly "Obey!" and "Suicide Love Addict" - discuss human nature and primal instinct. I've been performing and composing death and black metal since 1997, so VOLKER allows me to explore new horizons. I wanted to play something different and a bit more similar to my first loves, GUNS N' ROSES and NIRVANA. I'm very excited to get this project out there. I feel more like myself - more like a rocker than a metal guy. Emmanuel, our bassist, always felt the same way, so it was a no-brainer to make this project a reality." After releasing their debut EP to positive reviews and touring with major metal artists such as MOONSPELL, VOLKER caught the eyes and ears of representatives at Overpowered Records. The label was also impressed with the band's extreme metal origins and how these talents transformed skillfully into to a brilliant heavy rock project. Overpowered Records label representative Arnaud Bondelu says: "The origins of our partnership with VOLKER were a little bit unexpected, but welcome. Nicolas, the director of a truly great label based in the same town as us (Lille, France) called Kaotoxin Records, introduced us to a black metal band called OTARGOS. We later found that the members of that band founded another group, VOLKER, and performed in a totally different style. The music was just as amazing, but in a completely different way. Kaotoxin had already signed VOLKER and we thought our chance at working with them had passed, but when the label suddenly had to cease operations, the partnership between VOLKER and Overpowered Records picked right up where they left off. We're really proud to work with VOLKER because we believe they are truly one of the greatest rising bands to come out right now, and will make an impact in the coming years. We're very motivated to push them out there internationally."